When you’re pregnant, your body needs more nutrients, vitamins, minerals, and even calories than normal. But you may find it challenging or even overwhelming to maintain yourself and your baby without going a little off course in your overall nutrition. So stay away from poor eating habits and unhealthy foods. Try to keep your body and your growing baby as healthy as possible. To do that, read this list of the most important nutrition tips you should follow while you’re pregnant. When you’re pregnant, you need a diet high in fruits, vegetables, and whole grains to help you prevent constipation and to keep you feeling full. High-fiber foods are packed with the vitamins and minerals that are essential to your body and your baby’s development. 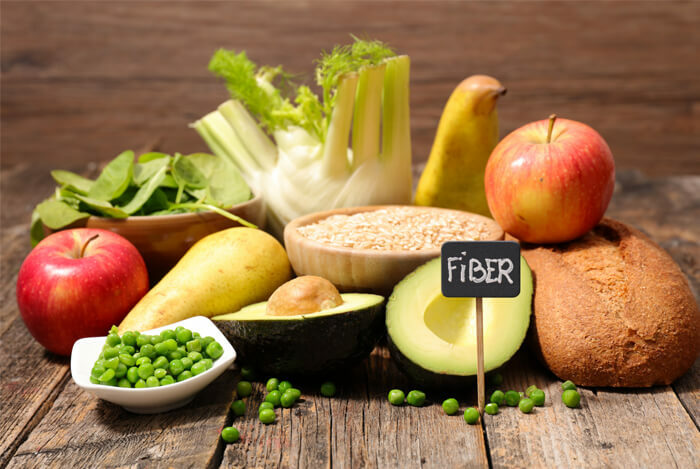 Try to get 25 to 35 milligrams of fiber each day. Most people know that calcium helps build strong bones – but did you know it’s crucial to your baby’s skeletal development? You want to consume at least 1,000 milligrams of calcium a day, so try to fit as much calcium-rich food into every meal as possible. Because iron transports oxygen, your baby needs a healthy amount to develop properly. This mineral is difficult to get enough of during your pregnancy, but it’s critical for normal development and growth, and for preventing premature delivery. 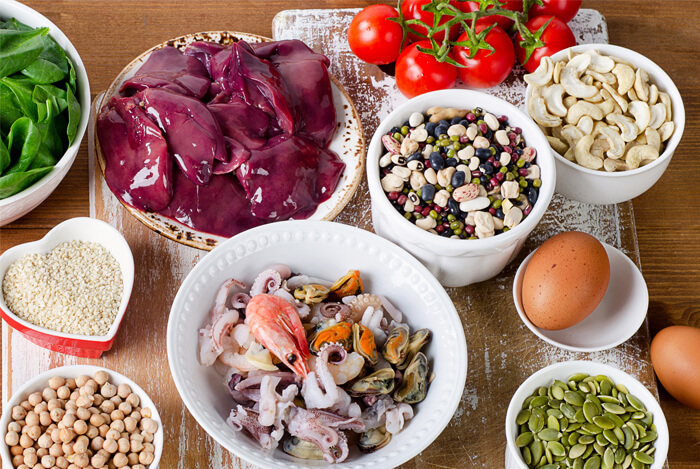 So, when you’re pregnant, try to include several iron-rich foods in your diet every day. Low-Fat Dairy – You need extra calcium when you’re pregnant, and low-fat dairy contains both casein and whey protein. Legumes – Lentils, peas, beans, chickpeas, soybeans, and peanuts are excellent plant-based sources of fiber, protein, iron, folate, and calcium. In fact, one cup of lentils, chickpeas, or black beans can provide up to 90 percent of your RDA for folate. Sweet Potatoes – Rich in beta-carotene, sweet potatoes are also high in fiber. 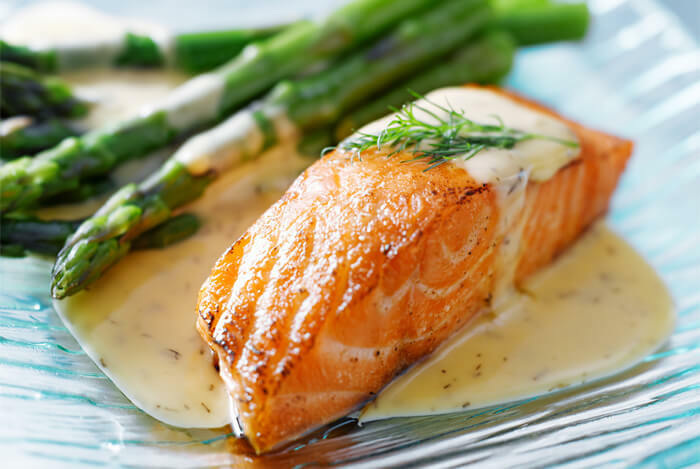 Salmon – Salmon is packed with essential omega-3 fatty acids, which pregnant women need. Eggs – Eggs contain 77 calories, along with high-quality protein and fat. They also contain tons of vitamins and minerals that are important for both the mother and child. Choline, found in eggs, is essential for brain development and health; a single egg contains roughly 113 milligrams of choline, about 25 percent the RDA for pregnant women. Leafy Greens – Broccoli, kale, spinach, and other dark leafy green vegetables contain fiber, vitamin C, vitamin K, vitamin A, calcium, iron, folate, and potassium. They’re also rich in antioxidants, have a high fiber content, and have been linked with a reduced risk of low birth weight. Lean Meat – Beef, pork, and chicken are rich in protein, iron, choline, and the B-complex vitamins, which are essential during pregnancy. Women eating red meat regularly in particular can meet their RDAs for each of these nutrients. Berries – Berries are full of water, healthy carbs, fiber, vitamin C, and rich plant compounds. What’s your take on eating for pregnancy? Have anything else you’d like to share? Let me know in the comments below!